Plasma cutting is a process that is used to cut steel and other metals of different thicknesses (or sometimes other materials) using a plasma torch. In this process, a gas is blown at a very high speed out of a nozzle and at the same time an electrical arc is formed through that gas from the nozzle to the surface being cut, turning some of that gas to plasma. The plasma is hot enough to melt the metal being cut and moves sufficiently fast to blow molten metal away from the cut. At AH Stock Manufacturing Corp., we offer our customers a solution to all of their manufacturing needs, from engineering to finished products. 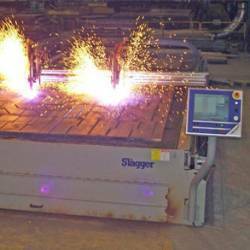 In addition our Messer Metal Master High Performance Plasma cutter has a table capacity of 1.25" thick plate and can handle steel sheet sizes to 96" x 240". Call us today at 920.726.4211 to speak to one of our friendly and knowledgeable sales professionals.